“Spock: Do you believe in the concept of service to mankind? Spock has been with me for as long as I can remember. Unlike other characters from movies or comics, Spock was someone I identified with from my first encounter, and that impact has never faded. Throughout my childhood, Spock set the standard for how to remain calm in a moment of crisis, especially for an overly sensitive kid. But foremost, he taught me to control my emotions when life seemed overwhelming. To maintain an ability to step back and survey the situation from afar, allowing for a more reasonable judgment. He was also the quintessential outsider, being half Vulcan and half human, never fitting in with his home world, and yet also being an alien on the Enterprise. I was a sensitive kid in Texas, raised to hunt and kill animals as a rite of passage, so I identified with his struggle. The contrast of growing up obsessed with Disney movies of anthropomorphized animals, yet having to hunt them in real life, was a conflict I could never resolve. Spock at least provided a role model, which was far better than the “pray about it” resolution I was taught at First Baptist Church. This weekend, on the passing of Leonard Nimoy, I read numerous eulogies, most stating the same thing: that in spite of Spock’s emotional distance, his character was the true heart of Star Trek. I fully agree. 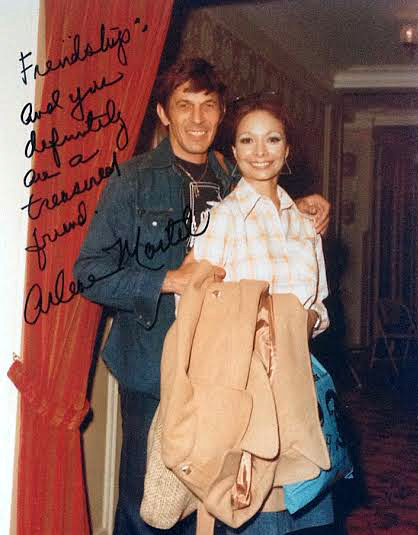 My friend Arlene Martel, the wonderful actress who played Spock’s wife T’Pring, gave me this great photo of her leaving the studios where she ran into Nimoy.